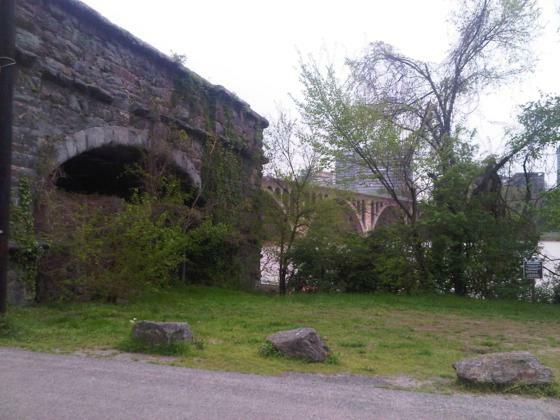 Just upstream of the Key Bridge in Georgetown, I am sitting on a large block of stone - part of an old bridge abutment - staring across the Potomac River at a lone masonry pier. The pier stands steadfast against the river current, almost as a bulwark against time, a last, proud remnant of the Alexandria Aqueduct (or Potomac Aqueduct* as it is also known). 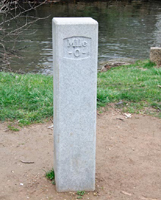 As an interpretive Park Ranger at the C&O Canal, I can imagine the clop-clop of mule hooves and the clank of wagon wheels on the wooden planks of the Bridge on that steamy July night. 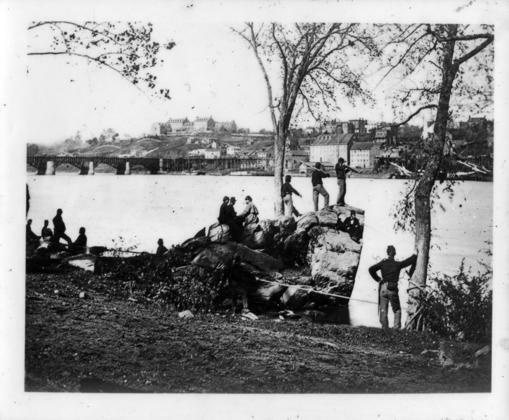 The sound echoing in the still air at Georgetown signaled the start of the fateful war that pitted brother against brother, Union against Confederate and North against South. It was the sound of a battle that could no longer be avoided. And as those mules pulled wagons carrying home casualties from that deadly contest near a railroad junction at Manassas, it was as if the war itself were being borne to the very bosom of this great divided nation. 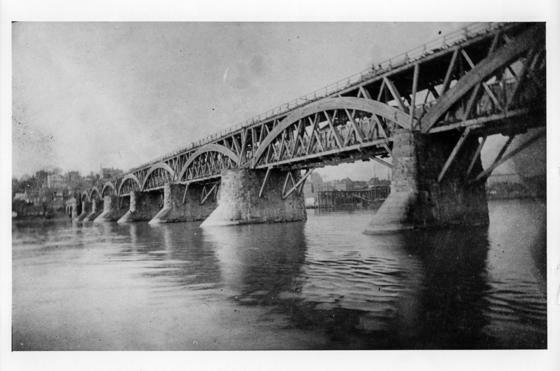 Built between 1833 and 1843, the Alexandria Aqueduct Bridge stood as a technological marvel of early 19th century engineering. 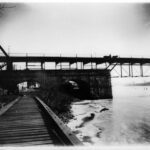 It was designed to connect the Chesapeake and Ohio Canal to the neighboring seaport at Alexandria via a seven-mile-long canal. 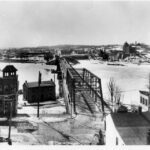 The citizens of Alexandria wanted to share in the benefits of trade and commerce from the west, not unlike the benefits the Erie Canal brought to New York City. But construction of the C&O Canal stopped at Cumberland, Maryland, far short of its goal of bringing goods from the Ohio River Valley and beyond down the Potomac. Despite the loss of the much-anticipated commerce from the west, the demand for Western Maryland coal increased, buoyed by the expansion of industry here and abroad. By 1859, the port of Alexandria received nearly three-fifths of the coal carried on the C&O Canal. Those gains were short-lived when in 1861, military necessity trumped the desire for economic gain. 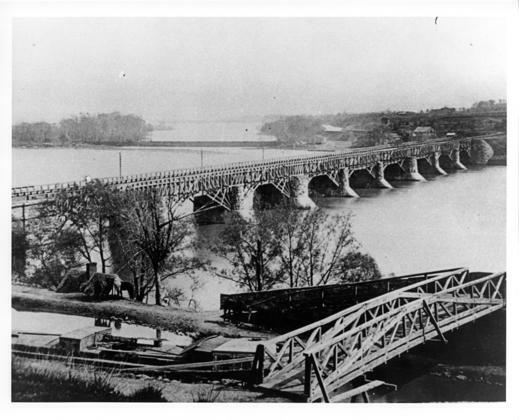 The federal government seized the Alexandria Aqueduct, drained the water from the trough, and converted it into a roadway for transporting troops and supplies. 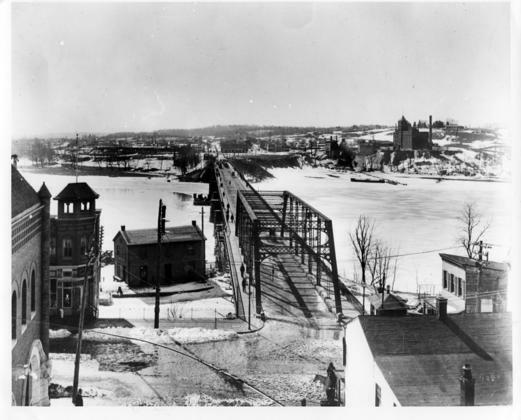 After the war, the roadway was removed and the Alexandria Aqueduct Bridge was converted back into an aqueduct, with a toll bridge above. 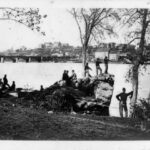 This time, technological advances signaled the demise of the aqueduct: steam-powered tugs could now tow canal boats down the Potomac River to the coal wharves at Alexandria. 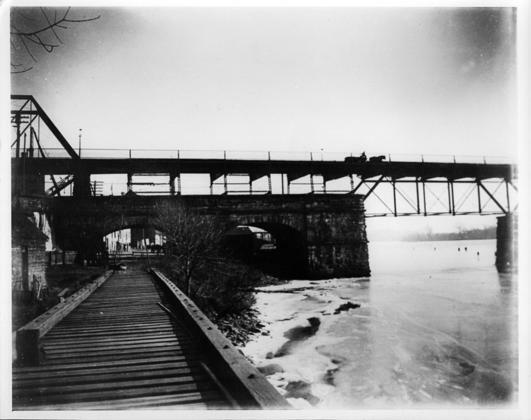 Although the Alexandria Aqueduct Bridge survived in different forms until 1923, canal boats would never be seen again floating above the Potomac River. Only one proud sentinel remains, in the form of a lone pier standing watch over the River. 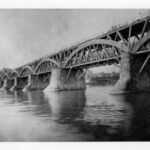 *What most people know today as the Alexandria Aqueduct is also called the Potomac Aqueduct. When the Chesapeake and Ohio Canal was built, aqueducts, locks, lockhouses, and culverts were given numbers. Over time, people gave these structures names. Aqueducts were usually named for the body of water they traversed. For example, the Monocacy Aqueduct crosses the Monocacy River. 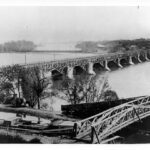 The Potomac Aqueduct was built by the City of Alexandria and became known as the Alexandria Aqueduct for the city it served.